The WCC advocates for public access to waterways and street-ends in our neighborhood. We work with Friends of North Lake Union (FONLU) to maintain and improve shoreline habitat, and to provide public access to Lake Union. Please help us to raise awareness of each waterway by posting your photos and comments on Google Maps and other social media sites! Celebrate Earth Day with a Spring Clean Up of Northlake Way! Sunday April 22, 2018, 11 AM – 2 PM and 2 PM to 4 PM. Join your neighbors for an Earth Day clean up of Northlake Way! Clean up & weeding with City Fruit, and/or clean up with the Shorelines Committee. See the post for full details. All are welcome! 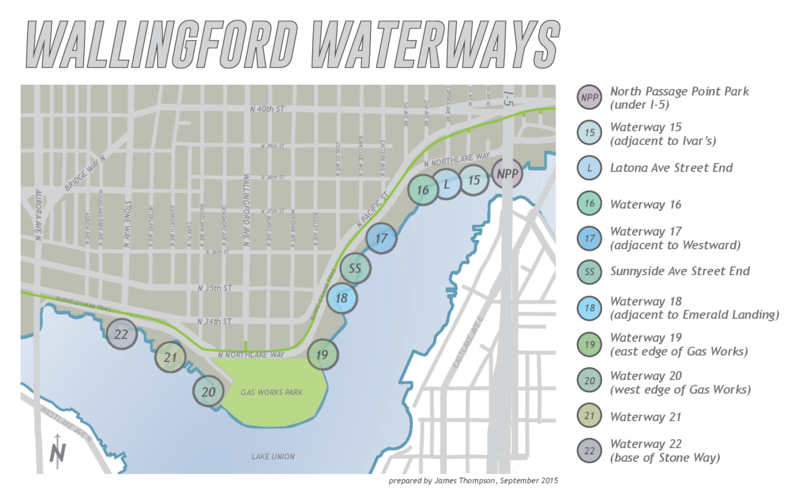 Map of waterways and street-ends in Wallingford. Prepared by James Thompson. © Copyright 2015 Wallingford Community Council. All Rights Reserved.